Kendata Peripherals has introduced a new version of its SEMS software utility to work in conjunction with its recently launched ScanAnPro forms processing package. Designed to significantly reduce the amount of time spent by teachers and lecturers on the marking of multiple-choice exams, SEMS for ScanAnPro provides a simple report showing the title of the exam and a listing of candidate numbers, student names, corresponding percentage marks and the number of questions answered by each student. After the students' answer sheets have been scanned, and ScanAnPro has entered their responses into an Access database, the user simply scans in a master sheet with the correct answers. The SEMS for ScanAnPro utility then compares the students' answers with those on the master sheet and instantly generates the report. The master answers are retained in the database to enable future exam papers to be marked against them. In addition, the new software utility can generate student response feedback reports for use in assessments to enable individual students to see which questions they answered incorrectly so that they can identify the areas that need additional work. All reports can be saved as PDF files. 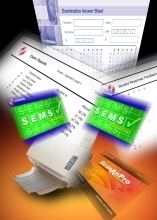 Particularly suitable for use wherever there is a range of computer literacy amongst teaching staff, the SEMS for ScanAnPro utility is supplied with a standard exam answer sheet, which can be overprinted in Word with the exam number and student names, if required. More advanced users may prefer to design their own custom answer sheets, and they also have the option of carrying out analysis and generating reports within Access. The powerful ScanAnPro forms processing software enables data to be scanned from paper forms directly into an Access database, from where it can easily be exported as an Excel document or in a variety of other file formats. ScanAnPro was originally developed for use in Kendata's forms-processing bureau, where it has successfully processed over a million A4 forms.